Since the January issue of The Biro Technical Bulletins, dealing with AWACS satellite interference, there has been no shortage of critical comments and constructive proposals. This prompted a further discussion of the subject and this Part II of AWACS INTERFERENCE. AWACS airplanes, easily recognized by their rotating 9-meter diameter circular radar-domes above the aircraft fuselage, underwent a comprehensive Radar System Improvement Program, a huge leap forward in performance. Electronically controlled elevation angle variation was added to the mechanical horizontal rotation. The radar's output was increased and the Pulse Doppler Compression Waveform mode applied. These changes increased the radar's range, enhanced detection sensitivity, as well as the tracking of smaller targets at greater distances. On the other hand, the upgrading caused an increase in the intensity of the interference. The comprehensive RSIP program missed the need for tighter interference control. "Airplanes flying at 75 miles and circling at 25,000 feet appear to the observer on the ground more than 1° or 2° above the horizon". We know that the curvature of the earth affects line-of-sight conditions, limiting the airplane’s visibility from the ground. 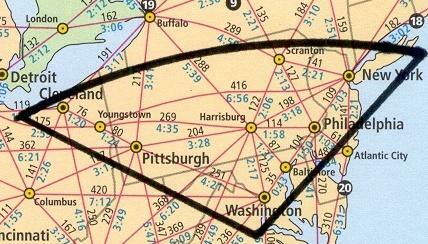 The 75 miles (120.6 kilometers) airplane distance is well within line-of-sight, and thus the airplane is visible. It is higher than the originally indicated one to two degrees, but still well below the 15° or 20° average elevation angle of GALAXY 5 on the East Coast. A high quality parabolic antenna should deliver adequate protection. The area affected by AWACS activity over Washington, D.C. The best protection against AWACS interference signals, arriving at a low elevation angle, is an artificial barrier that is not too high and not too close to the parabolic antenna. The shielding efficiency, and thus elimination of the interference, can be significantly improved by covering the earth barrier's surface with microwave absorbing material, available in 2 by 2 ft pieces ranging in thickness of 3 inches and up. Absorption may reach 40 dB levels. Caution: protection degrades if the microwave absorbing material is exposed to inclement weather conditions for extended periods. 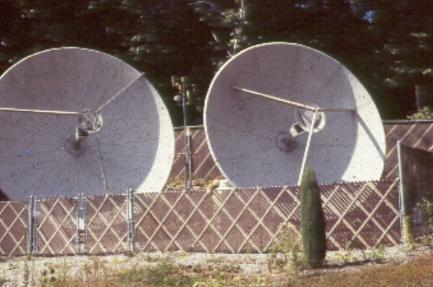 A fence in front of the dish, (see photograph below), is anything but a microwave barrier. It only providse protection against human vandals, not electronic interference. The 2-3 dB reduction of interference level cannot clear up the pictures. 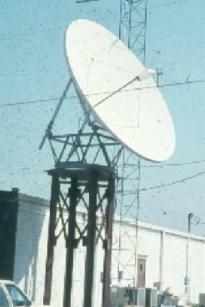 Parabolics for satellite reception, mounted on 10 to 15 ft high pedestals or telephone poles, see photographs below, are also unreasonably exposed to over-the-horizon type interference signals. Bandpass filters, including microwave bandpass filters, are imperfect electronic devices. They introduce insertion loss, thus reducing the Carrier/Noise ratio of the received satellite signal. Is there any practical method to verify the insertion loss of the filter? The answer is affirmative. Tune the spectrum analyzer, operated in the 20 MHz/Division or 10 MHz/Division horizontal scan mode, to either end of the 3.7 to 4.2 GHz transponder spectrum. You will find right at the edge one or two (occasionally three) low amplitude carriers, exhibiting constant amplitudes. They are AM modulated telemetry carriers, ideal tools for signal level measurements. 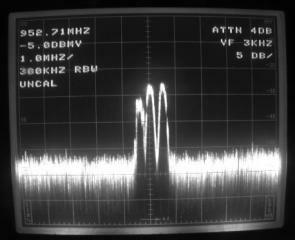 The photograph above, taken from the screen of the Tektronix Model 2710 spectrum analyzer shows the closely spaced spectrum of the GALAXY 5 telemetry signals. The center carrier's frequency was measured as 952.7 MHz. after the downconversion of the LNB. Record the amplitude of the center telemetry carrier while operating the analyzer in the 5 dB/Division or 1 dB/Division vertical deflection mode. This will provide a ±0.5 dB amplitude accuracy. There is no better way to compare the amplitudes before and after the insertion of the microwave bandpass filter. Do the results support the supplier's specifications? Depending exclusively on the hard work of smart CATV engineers and technicians to solve this problem seems unrealistic and inadequate. 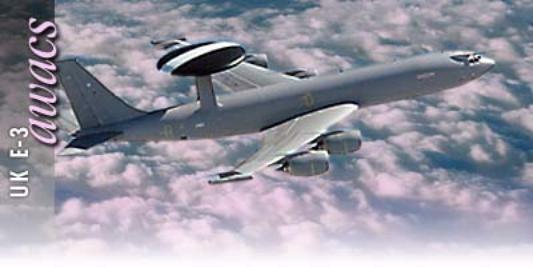 In an effort to dot the i's and cross the t's, different organizations have floated all sorts of proposals to prevent worsening AWACS interference conditions. While it is possible that FCC or other government agency might take action, involvement by a national technical organization is required to ensure a serious response. Respecting the need for greater security and safety of the American people, we call on the Society of Cable and Telecommunications Engineers to focus attention on solving the thorny issue of AWACS INTERFERENCE. What is your opinion fellow CATV engineer?